And so we arrive at the difficult noblebirdie, Sakuya! I hope you guys can appreciate him in spite of his difficulty. Please don't skip over this route! This time we're going to sign up for the student council to spend some quality time with Sakuya. So it'll be nice to see those scenes for real without blowing them on purpose. We sang birdie melodies. It was a little tiring, but singing together is fun. I was pretty sure I wanted to join it, but what does the council do again? We skipped the vote, and I think it's only Sakuya and me. Anyway, he called a meeting, so to the council-room I go! "This looks like a CEO's office!" Do you think I would stand for anything less?" So you had this done?" "Hmph! This room used to be filthy. Better suited to rabbits than to us." "Have you decided which position you will take?" "Who is there to choose for you? "Aren't you Japanese too, Sakuya?" I guess I have to pick a post now. "You wish to be my right wing?" You've got nerve. I like that." I think I just got bonded with. ...gosh, he looks pretty happy right now. And so I became vice-president of the student council. In a temper, as usual. a place like this? And on foot!" Now I'm just imagining human-Sakuya looking like another heir I know. SAKUYA YOU MIGHT NEED EXERCISE TO REMAIN HEALTHY FOR CHRISTS' SAKE. You're supposed to enjoy the change of scenery." Don't we have a nice view?" Sakuya looks like he still has something to say, but he reluctantly comes over to me. I think he's acting angrier than he really is. Today is a music history lesson. So much thinking outside the Bachs I feel like I'm going to fly off the Handel! But this is what Moztart is all about, I guess. "I wonder what those wigs felt like... they look like they're wearing ptarmigans on their heads." Oh no these are really cute. "Do you seek to mock the great masters, low-born philistine?!" I'm just casually going to cut out the lead-up to the sports festival again. Let's go see what Sakuya is up to as a cheerleader. There's something of a crowd around our cheerleader. I see Sakuya and... a brass band? That's overdoing it. I think I saw something similar at the changing of the guard at Buckingham Palace. "You're not cutting any corners, I see." Only the best from a Le Bel." "Sir! Preparations are complete, sir!" There's a new song that plays here, but seeing as I can't even find the track for this festival I doubt I'll ever find this tiny track that plays at one part during this festival, so I'm not even going to try. And so the band began to play. Where did he get these people? They all look like professionals. I seem to be in charge of the cymbals. One wrong slip, and I'll be the laughing stock of the playground! Sakuya's conducting is awfully flashy. Is this the Le Bel style? Test scores come back. We did terribly. Whatever! With the festival and the midterm over, there's nothing to look forward to but summer heat. Huh? There's a bunch of birds in front of the staff room. What are they doing? Brian won his seventh Pulitzer!" He gestures at a news clipping on the staff room pinboard. It says "Brian, the first Intelligent Pigeon, Crowned Again." "Don't tell me you don't know who he is!" "I think I've heard the name, but..."
"He's the worlds' most famous blogger. He began when birds were barely intelligent." "He's a very skilled and insightful writer." "He was the one who suggested that the dove olympics be called the 'Pigeolympics'. He's extremely influential - the name was adopted right away." "Why don't you try looking him up right now, mon amie? Try Googling 'Brian Pigeon'." Additionally, don't you think calling the Olympics 'dove Olympics' or 'pigeolympics' is really rude and exclusive of other groups like parakeets, finches or quails like our dear Nanaki-sensei? I'm surprised Tumblr hasn't had a field day with this yet. "...uh-oh, lunch is nearly over. I'd better hurry back to class! There's a pile of overturned desks in the middle of the floor. Ryouta is overturned next to them. "I mean, wait, what's going on!?" I look up to see the two of them at each other's throats in the corner. I think we might have a diplomatic incident on our hands. "Sakuya was making fun of Okosan..."
"He called him a stupid mongrel who only thinks of imaginary pudding, and said he was ashamed to be in the same class..."
I mean, Okosan is a nutcase and I don't know what he's saying half the time, but he really does like pudding!" "Either way, Okosan kind of went for the jugular, and..."
"...you tried to pull them apart, and Okosan used WING ATTACK on you?" "Y-yup... you're our only hope now, Hiyoko...! "You tell me to take back my word? I shall not!" "A mongrel like you hasn't even the right to speak to me." The battle still rages, and it looks like Ryouta's sacrifice was in vain. This time we're going to side with Sakuya, but I'm going to make an extra save file so I can save scolding them both in the Bonus Materials post I make before proceeding with BBL. "Okosan, settle down! This is a classroom!" (This is a matter between doves! "You are a credit to your simian ancestry, Tosaka. I respect your judgement." I catch Okosan and throw him out the window. "Just because you're angry doesn't mean you can make a mess! Come back in when you're prepared to be civilized!" There's no Sakuya content here, so let's just move along. 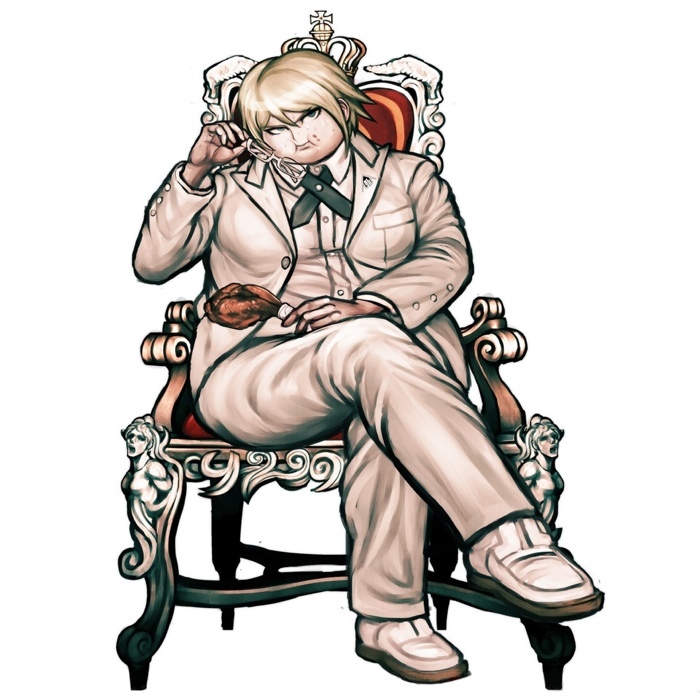 Poor dumb-as-a-post Hiyoko. Don't worry, music is sort of like mathematical knowledge, right? "Coo, coo ♪ coo cooo, coo coo ♪"
What this is meant to say, I believe, is "français n'est pas impossible" which would translate into "French is not impossible." Instead it is "Impossible is not French". In other words, Sakuya doesn't actually speak French, in spite of living in France for years, apparently. He can't even form a proper sentence. Actually, "Impossible is not French" is something Napoleon said. Another translation is "You write to me that it is impossible; the word is not French" or "Impossible is a word to be found only in the dictionary of fools." For some reason that grammatical possibility didn't even occur to me. Thank you! "I wish to become a famous artist whose work is known the world over!" And then Nanaki asks to take us home blah blah, you know. Back to Music! Check out that Charisma score. No one will be able to win a sense motive check against us ever again. I've been placed in charge of the timpany today. "What am I supposed to be, the musical gorilla?!" We get our finals back. We do terribly. No one is surprised. It's been a semester already...Sometimes it seemed long, and sometimes it seemed short, but either way, it's summer now! He always gets angry if I make him wait, so I should hurry! I came as fast as I could! "Very well. ""First, move the shelf and chairs, there's dust underneath." Arrange the files by date." "And then the floor. Polish it at least three times. And the windo--"
"Hold on. Are you telling me to do all that by myself?" A tiger's roar actually sounds with this one. Maybe I should stand up to him? "Sakuya, I'm the vice-president, not the charwoman." I've never heard this word before either, but as you can guess in context, it's a cleaning lady. "My job is to help you. So maybe you should be taking the lead role in cleaning up?" "That's why I'm giving you orders." "You know how to use it, right? "Don't tell me you've never..."
Talk about living in the lap of luxury. And so Sakuya reluctantly helped me clean. I thought he might complain for a while, but he certainly can be obedient! Now then... the sooner we can finish, the sooner we get to go home! "You've got nerve, to call me out during vacation. What is it?" "Oh, right! You just moved here, so you wouldn't have known." "Today's the festival! Let's go together!" "You'll understand when you see it. Come on!" "Shops! Food! Good fun all around!" "People can't possibly be eating food prepared like this! It's... It's unsanitary! It's madness!" "Don't worry! There haven't been any reports of food poisoning for two years!" "So there were reports three years ago?!" Guiding the panic-stricken Sakuya around the festival is a little troublesome, but hilarious nonetheless. "Huh? Where did you buy that candy apple, Sakuya?" "They had an interesting colour, so I thought I would buy one. I'm not going to eat it. I shall take it home and mount it in a case." It's a statement of ambition. Sakuya's not an idiot. Ooh, okay. I don't know much about European history. I'll edit this into my post, thank you! It seems like if there's a Sakuya-doesn't-get-it moment here it would be him wanting to know the point of it, and being told to wish for something impossible, and getting shirty. There's no impossible.